Paul Company engages in production of specialized chassis with Mercedes-Benz components. At the IAA 2012 it presented a huge Heavy Mover 80 570. But it is the "least powerful" version in the range version equipped with a Mercedes-Benz 570 hp engine. The capacity of the power plant can reach 610 and even 650 hp. The 570-horsepower unit is equipped with a 16-speed transmission Mercedes-Benz, while two more powerful engines work with 7-speed automatic Allison. A cab is also borrowed from Mercedes-Benz Actros MP3. Gross weight is 80 tons. At the rear of the chassis is 170-ton hook Rockinger, ie gross combination weight will be as much as 250 tons! Tractor wears in Michelin tires with dimensions of 875/65 R 29. 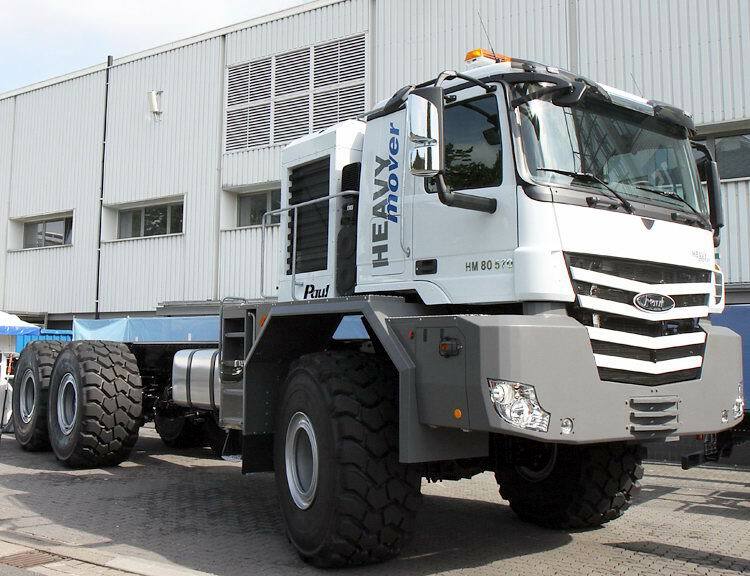 The overall height of the truck is 1.92 m, width - 3.5 m.